I started to learn more about missionary work and hear about short-term missions when I joined CCiL in the year 2008. Each October we have a mission conference, where we listened to what mission means to Christians and sharing from many missionaries about their work. The Mission Concern Team also arranges missionaries or brothers and sisters who have been on short-term missions to share their experience during Sunday services. While we are unsure of how God wants to use us with our skills and experience, my husband, Tim, and myself have been praying to God to show us how He wants to use us to serve Him. We believe that going onto a short-term mission would be an eye opener to see what God has planned for us and we have been praying for an opportunity. While we are preparing for our permanent move to the US, we heard about the short-term mission to Toulouse, France. With our skills matching the requirements, we applied for it immediately and we are really thankful to God for letting us go with the team. Under the leadership of Pastor Hung, the team is made up of 6 brothers and sisters from 3 different congregations. God showed us His wonders even before we went onto the trip! A brother who used to worship with us in NSC is sent to Toulouse for 4 months because of his work, coinciding with our visit. 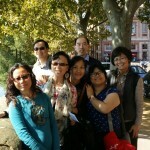 We contacted him and introduced the Toulouse Chinese Christian group to him. He bonded with the students and missionaries there even before the team had its first meeting. He has helped us greatly in communicating with the Toulouse group and in preparing an evangelical drama that is meaningful to those who are seeking God there. It is truly amazing to see how God is in control in every way and the way He works is beyond our wildest imagination. Along with the missionaries, we visited university campuses and randomly went up to any “Chinese-looking” students to start talking to them about Jesus. It surprised us how open they are in listening to the Good News. While we were amazed how God has prepared the hearts of these people to listen, this also made us reflect on why we can do this with such passion on a short-term mission, but not from day to day in the city we are living in. We were also in shock of how real it is, that “the harvest is plentiful but the workers are few” (Mt 9:37), with so many Chinese students out there we are still unable to reach out to. On the second day, one of the missionary brought Tim and myself to visit a couple having similar background to ours – they are also newlyweds and the husband is an oversea research student. Since this visitation was our first time seeing this couple, we did not know what to expect and could only pray for the Holy Spirit to lead the conversation. There, we saw again how God has already prepared their hearts to listen and used our experience to connect with them. They were really interested in listening to our stories of how God work is in every bit of our lives, and it has stunned them as we shared how we encounter and experience God as scientists. The three days went by so quickly. However, seeing these snapshots together with the sharing from the missionaries there, gave us a wider picture of missionary life and the struggles that they face. What I have also taken from this trip are reflections and encouragements. 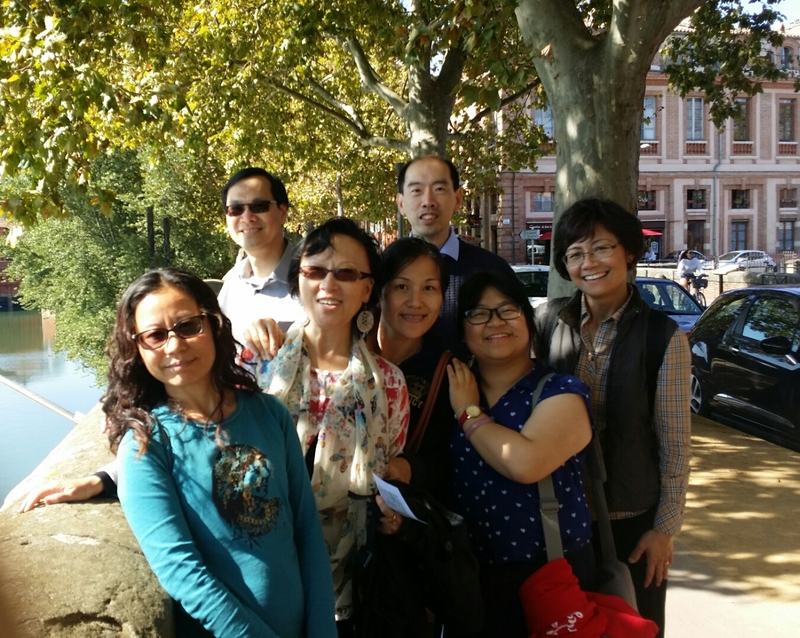 With the very limited resources that they have (no church building, no Pastor, no IDMC etc), the missionaries and those in the Toulouse Chinese Christian group showed me that what matters is not how much they have, but a pure and simple heart that is willing to serve our Lord and to reach the lost souls. Everything was in His hands, sovereign grace and love for His children in His precise timing.I praised the Lord for setting the theme for Toulouse as ‘Family’. We were indeed a family. He dealt with us in three or more significant parts and allowed us to plant lots of seeds of truth for each other Christians or non Christians alike. Throughout the three days, He healed, motivated, encouraged, inspired and protected His people. He has dealt with the apparent objectives reaching out to new students and seekers. He has blessed even more by challenging the UK team and the Toulouse team to dace bravely the dark side within themselves. He helped me to see more the humanity of missionaries that they too have their needs just like anyone else in a deeper level. He inspired me to have once again the last minute change of the sermon contents to a human related spiritual sharing. The theme family has helped to feel more a family in the Christian world that we are really one family in Christ. Clearer picture of what humility and agape mean. Unconditional acceptance of brothers and sisters in the family in Christ.